Jim Mair is a multi-instrumentalist specializing in saxophone, flute, percussion, jazz piano and voice. 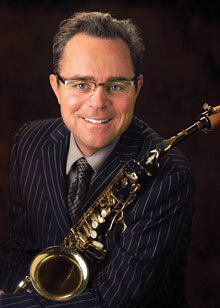 As a high school student in 1984 he played lead tenor saxophone in the Canadian High School All-Star Big Band. That same year his quintet was selected top combo in Canada. He has been a full-time college professor for 24 years. In 2017 he was the recipient of the UMKC Conservatory of Music and Dance Alumni Achievement Award. In 2015 he was awarded an Honorary Degree from the University of West London, College of Music in the United Kingdom. In 2014 he received the League for Innovation Excellence in Education Award and in 2013 he was the recipient of the Henry Louis Outstanding KCKCC Faculty member award. In 1996 he received the University of Mary Alumni Recognition Award. As a director/performer, his ensembles have appeared at the Havana Jazz Festival in Cuba (actually in Cuba when the President lifted the sanctions), the Montreux Jazz Festival in Switzerland, the IAJE and JEN Conferences, Birdland in New York City along with the JVC Jazz Festival and at Carnegie Hall. He has conducted multiple all-state jazz ensembles. He has served as a clinician/adjudicator across North America for the Conn-Selmer Instrument company for over 25 years. He has been a CD reviewer for the Saxophone Journal and a jazz radio host across the northwestern United States on National Public Radio. Jim has been a featured cover story on four periodicals and was also voted Best Saxophonist by the readers of JAM magazine in Kansas City. Jim and his wife Mary founded the non-profit Kansas City Jazz Orchestra and the Kansas City Jazz Alliance, two of Kansas City’s most active jazz organizations presenting a subscription series, monthly concerts, annual festivals and camps and frequent master classes. Jim holds music degrees from the University of Mary and the UMKC Conservatory of Music, and has done additional study at the Banff Jazz Workshop and the Aspen Music Festival. Was the only passenger on a commercial airline flight from Kansas City to Salt Lake City. Pilot welcomed me over the intercom by name, and the flight crew asked if they could sleep and would I mind helping myself to the food and beverages.